Watch a video of the Master Class with Eric Mazur. 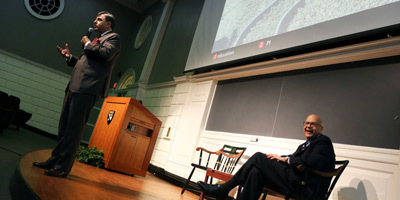 Eric Mazur, Balkanski Professor of Physics and Applied Physics at the Harvard School of Engineering and Applied Sciences, knows all too well that a lecture on physics could put most people in a classroom to sleep. It is something that he learned the hard way. As part of Master Class, a series that began at the Ed School a year ago as an opportunity to celebrate and investigate great teaching happening throughout Harvard University, Mazur's session, "Confessions of a Converted Lecturer," explored how he developed and practices peer instruction — a method for teaching large lecture classes interactively. “Active learning, not passive [learning] makes it impossible to sleep through a class,” Mazur said. Mazur shared a photograph of his early days teaching, in which he was shown hunched over a projector, disengaged from the students. The students looked equally unengaged with the lesson. Describing the scene as a “transfer of information,” he noted that there was a “lack of learning and retention” from his lectures. By the seventh year of teaching, Mazur was forced to admit that his students weren’t grasping the concepts he was presenting to them. In a moment of despair, he told students to discuss a question he had posed with one another. Within two minutes, they had figured out the answer. That pivotal moment made him realize what needed to change was his teaching. From then on, he began experimenting with more active learning styles where students engaged with one another to help find the answers. His interactive teaching method has gone on to earn a large following internationally and nationally. As a brief demonstration, Mazur posed a multiple choice question to the Master Class audience. Using a handheld polling mechanism, he asked the crowd to select an answer. Then, he encouraged the audience to talk with a neighbor who had selected a different response and attempt to persuade their classmate to change his or her answer. After several minutes of discussion, Mazur asked the audience to once again answer via the polling mechanism. By the time Mazur revealed the right answer to the question, he noted that he had the attention of everyone in the room. The process, Mazur explains, sets up students to commit to an answer, then move to the reasoning behind it. From there, he said, through the discussion with their peers, the students often become emotionally invested in the learning. HGSE Professor Richard Light, discussant at the Master Class session, asked Mazur whether this type of teaching could translate into the K–12 classroom.